On the 14th (Thu), contemplate in the serene atmosphere at Kamppi Chapel of Silence and then admire the masterpieces at Kansallisgalleria. To see ratings, where to stay, maps, and tourist information, refer to the Helsinki route planner. Copenhagen, Denmark to Helsinki is an approximately 5-hour flight. You can also do a combination of train and flight; or do a combination of train and ferry. Traveling from Copenhagen to Helsinki, you'll lose 1 hour due to the time zone difference. Expect slightly colder temperatures when traveling from Copenhagen in February; daily highs in Helsinki reach 0°C and lows reach -3°C. Finish up your sightseeing early on the 15th (Fri) so you can travel to Rovaniemi. Your day-by-day itinerary now includes Ivalo Safaris. On the 16th (Sat), explore the wealth of natural beauty at Urho Kekkonen National Park and then join in the after-dark buzz at Ivalo Safaris. 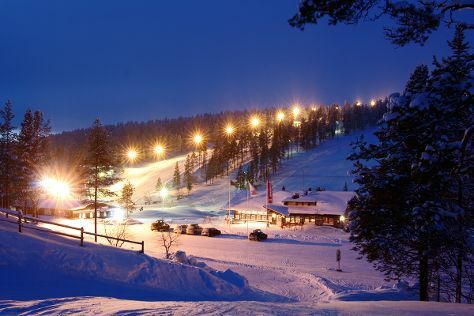 On the next day, fly down the slopes at Saariselka Ski & Sport Resort. To find ratings, other places to visit, maps, and other tourist information, read our Saariselka trip planner . Traveling by flight from Helsinki to Saariselka takes 4.5 hours. Alternatively, you can do a combination of flight and bus; or drive. In February, Saariselka is slightly colder than Helsinki - with highs of -6°C and lows of -15°C. Cap off your sightseeing on the 17th (Sun) early enough to go by car to Rovaniemi. Kick off your visit on the 18th (Mon): see exotic creatures in open habitats at a safari tour, then see Santa Claus Office, and then get in on the family fun at Santa Claus Village. To find maps, where to stay, and more tourist information, go to the Rovaniemi holiday planner. Traveling by car from Saariselka to Rovaniemi takes 3.5 hours. Alternatively, you can take a bus. In February, daily temperatures in Rovaniemi can reach -6°C, while at night they dip to -11°C. Finish your sightseeing early on the 18th (Mon) to allow enough time to travel back home.